Want a great way to bring writers — a.k.a. readers, a.k.a. insatiable bookavores — into your bookstore? 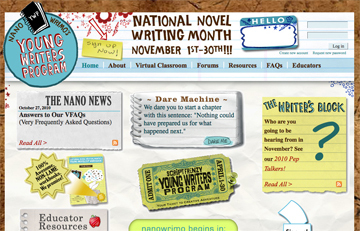 Host write-ins all November long by partnering with the world’s best writingpalooza, NaNoWriMo. There are materials for participating bookstores, including a window cling, a press release, several web badges and links for your store websites, even a list of suggested books for a display. 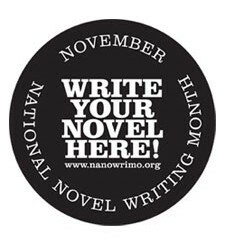 For the non-obsessive writers among you, NaNoWriMo stands for National Novel Writing Month, a period of 30 days formerly known as “November” that involves frenzied nonstop fiction formulating with a total goal of 50,000 words by the 30th. The focus is on quantity, not quality. Producing 50,000 words in 30 days pretty much guarantees that your inner editor had better shut up, or you’ll never get there. What a liberating idea! You don’t need to be good; you just need to sit down and write. 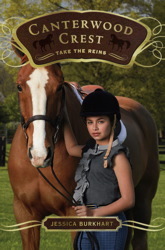 This novel challenge (dreamed up by NaNoWriMo founder and freelance writer Chris Baty) began in 1999 with 21 writers, and has grown over the years from a personal project to an international phenomenon numbering, in 2009, 119,301 adult participants and more than 35,000 kids and teens in 1,200 classrooms. 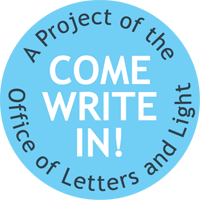 A few years ago, NaNoWriMo started a wildly popular international Youth Writing Project; 3,000 school and library groups are participating this year.The YWP (read a terrific article about it here) has its own very appealing website and resources for teachers. Bookstores can get involved by hosting write-ins — daytime or evening writing sessions where participants can bring their laptops, preferably drink gallons of coffee, and write their little hearts out in fellowship with their writing comrades. Since participants pretty much put their lives on hold for a whole month, these get-togethers break the solitude of NaNoWriMo and reassure writers that, even if they are totally insane to embark on this writing journey, they are not alone. They also have the coolest merch in their fundraising shop. 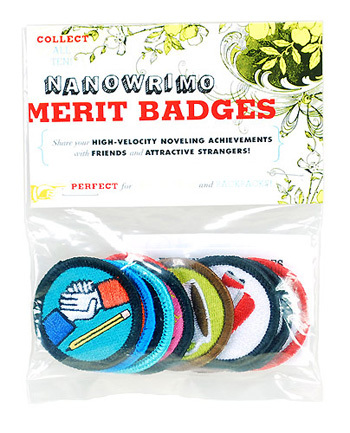 There’s a new poster each year, new designs for tote bags and t-shirts and mugs, and — my favorite of all — merit badges. Real ones, like the kind your older sister had all over her Girl Scout sash. These aren’t for starting fires and doing community service, though; they’re for things like Caffeine Abuse, Word-Count Padding, Random Ending, and Victory. This year also marks the organization’s first Great NaNoWriMo Book Drive, which enlists the help of people from all over the country to collect used books, send them to be sold at an independent online bookstore, which donates the proceeds to the organization and literacy efforts. The book drive guide says it best: “To run this book drive, we have partnered with Better World Books, a socially conscious online book store that has diverted 33 million books from landfills and raised more than $8 million for its nonprofit literacy partners by selling used and new books online. Better World Books provides the online book drive portal, sends free supplies, transports the books, and offers guidance for book drive coordinators.” Bookstores might consider starting a book drive in their regions this year or next. If you have lots of picture-book writers in your area, invite them to participate in their own version of NaNoWriMo. Writer Tara Lazar spun off the NaNoWriMo idea into Picture Book Idea Month, which charges writers with the challenge of, well, of what the title says: coming up with a picture book idea every day. Are YOU participating in NaNoWriMo, as a bookstore or as a writer — or both? Let us know, and we’ll cheer you on! This entry was posted in Uncategorized on October 29, 2010 by Elizabeth Bluemle. NaNo has always sort of evaded me in terms of rules. Still, I really like using it as a break from whatever else I’m busy with. I have a tendency to mull over outlining for so long that it takes me years to complete the 50k. If I’m lucky. I’m doing NaNoWriMo for the fourth time this year. It’s great fun! 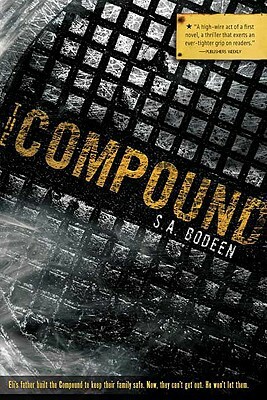 My novel from 2007 is on its fourth draft. The one from 2008 is useless. The one from last year is in line to be edited and is the best yet, I think. I’d encourage anyone who’s thinking about it to give it a try! Thanks for mentioning PiBoIdMo 2010! I write 50,000 words—or more—a month, each and every month! But I love the NaNoWriMo thing—what a novel idea! I did NaNoWriMo 6 years ago and finished the first draft of a novel I’d been stuck in the middle of for some time. Maybe I should take it up again to finish the third draft, which has also been languishing. I’m still on the fence about participating. I haven’t participated before and recently I’ve been thinking that I should. I have an idea for a new novel swirling around in my head. I guess this would be a good a time as any to get started on it. Go for it, Lovelyn! It’s so much fun! !